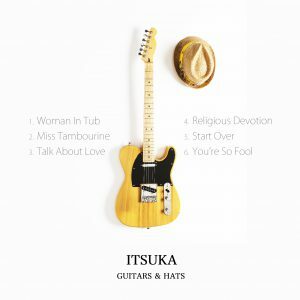 Itsuka is a singer, songwriter whose musical range encompasses rock, blues, folk and country music. Won the first prize at "Singer-Song-Writer Audition" organized by Hakase com in 2017. Growing up in Tokyo, Japan, and spending time in other countries being inspired by various kinds of music and culture she sings both in Japanese and English, has deep low bitter voice compare to other female Japanese vocalists.. Her strong positive message to life and society attracts NPO organization as well as the audience. In 2017, she won the first prize in Singer-Song-Writer audition organized by Hakase com. She received an Outstanding performance award in Zip-FM radio DJ competition and has produced many music programs over the years. She has her own YouTube Channel “ITSUKA morning TV” where you can enjoy the latest music news and Guitar, Pedal, App reviews. She also performs Rock covers and her original songs in the show. 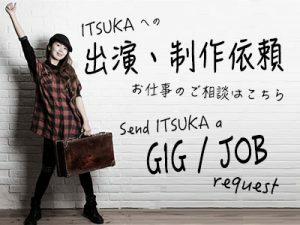 Being richly endowed with natural ability in the arts Itsuka enjoys working in photography, videography and graphic design creating all the art works for her own CD jacket and concert flyers. She is known for her unique fashion style and has modeled for both fashion and hair shows. She has acted in foreign films and composed the theme to an American film. She will tour Europe with a Japanese female rock band Dirtrucks as a bassist. She's known as a big fan of the cocktail Red Eye. ITSUKA is the chief of the Red Eye cocktail committee "RED EYE LOVERS". G7 CRAFT BEER HIGHBALL "Girls DJ Night"
MEET UP Tokyo "HALLOWEEN PARTY 2014"
Small Cast Radio Networks "FOREVER GUITAR KIDS"
Small Cast Radio Networks "LOVE from the WORLD"
Chofu FM 83.8 Mhz "BIG TIME SERIES Ongaku Wakusei"
FM YAMATO 77.7 Mhz "RED EYE FLIGHT 5"
Web Program OLYMPUS official USTREAM "PEN-FRIEND unnatural-カメラウーマンへの道-"